A famous Hollywood anesthetist yearns for a more simple, authentic reality, so when his long lost cousin invites him over for Thanksgiving, he drags his snotty spoiled family along to meet what of course turn out to be a bunch of rednecks with a heart of gold. 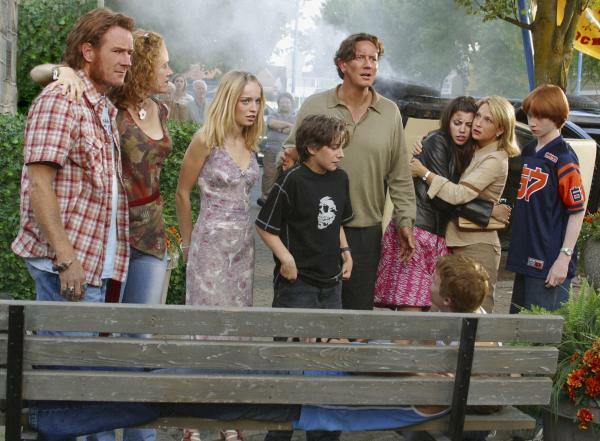 Holiday Reunion, also known as Thanksgiving Family Reunion, is a TV-movie directed by Neal Israel (Bachelor Party) and written by duo Marc Warren & Dennis Rinsler (creators of Disney Channel’s Cory In The House). It stars Judge Reinhold (Swing Vote), Bryan Cranston (Malcolm In The Middle), Penelope Ann Miller (Blonde Ambition) and Hallie Todd (Lizzie McGuire) among others. It is released under the National Lampoon banner. Trailer and review after the jump. I know what you’re thinking: yes, I subjected myself to another National Lampoon film. Despite the similarity in titles, Holiday Reunion is not a sequel to previous Movie Of The Day Class Reunion, instead taking its inspiration from the brand’s signature Vacation series (the film’s tagline acknowledges this, stating “This family trip is no Vacation”). Unsurprisingly the film is nowhere near as good as the Vacation movies, though to its credit it has a few more laughs than Class Reunion (which is however much better made). The film’s two recurring gags, one which has a dog named Yoko coming up from behind to lick Judge Reinhold’s balls while a background singer croons “Yo-Ko!” and the other having an old dude farting loudly, should give you an idea of the picture’s sense of humor. Yes, it’s that bad and both happen at least five or six times throughout the movie. I guess the acting is decent considering the material these poor guys and girls were given to work with, as the script is an absurd mess of annoying clichés you’ve seen better handled elsewhere, full of clunky dialogue and bad characterization. Overall a very poorly-made film, even considering the fact it’s a National Lampoon production that was made for TV. Verdict: One to miss. Holiday Reunion currently holds a 3.5/10 on IMDB and a 0% on Rotten Tomatoes. This entry was posted in American Films, Movie Of The Day, Movie Trailers, TV Movies, Videos and tagged Bachelor Party, Blonde Ambition, Bryan Cranston, Cory In The House, Dennis Rinsler, Disney Channel, Hallie Todd, Holiday Reunion, Hollywood, Judge Reinhold, Lizzie McGuire, Malcolm In The Middle, Marc Warren, National Lampoon, Neal Israel, Penelope Ann Miller, Swing Vote, Thanksgiving, Thanksgiving Family Reunion, Vacation by Mr Hollywood. Bookmark the permalink.